In 1991, David A. McLean and Associates, Inc. (or DMA) began as an engineering consulting firm that specialized in solutions in the fields of energy, environment, fueling engineering, and occupational health and safety. Beginning in 1993, DMA began to focus on the applications of alternative fuel systems, vehicle fueling technologies, and sustainable energy technology like fuel cells. Since 2006, DMA now stands for DMA Technical Services, Inc., with an international reputation built on team work and a dedication to excellence. The year 2006 is noteworthy too for DMA’s affiliation with the Kahn Group (Kahn) an award winning Architectural / Engineering Firm, headquartered in Detroit, Michigan since 1895. DMA and Kahn have an exclusive worldwide agreement to design and build alternative energy infrastructure wherever our customers need it. For more information about Kahn or visit www.albertkahn.com. Need Alternative Energy but don’t need to own the new infrastructure? Please contact our affiliate, Change Energy Inc., www.changeenergy.ca. Change Energy will be pleased to talk to you about innovative ownership and operation alternatives. 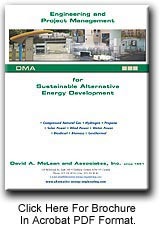 Over its history, DMA has developed an in depth understanding of the alternative energy fuels business that ranges from design and construction through the day-to-day operation of alternative energy business systems. Our fueling engineering experience has allowed DMA to participate in many alternative energy system projects with some of the most prominent corporations in the alternative fuels industry. To view a few of our past infrastructure engineering projects, please refer to Projects. DMA is a fully accredited engineering firm registered with the Professional Engineers of Ontario. NAFTA allows us to offer our services seamlessly throughout North America, which we have done on several occasions. DMA also has experience with energy system projects in Europe and Asia, making DMA a truly international firm. For a more detailed list of the Alternative Energy Services that DMA provides please refer to DMA Services.